Check Rates & Availability at Super 8 Show Low! Welcome to the Super 8, Show Low in Arizonas White Mountains The Super8 hotel is ideally located in the Ponderosa Pines in Arizonas White Mountains, close to attractions like Show Low Lake, Sunrise Park Resort, Salt River Canyon, the Mogollon Rim, the Petrified Forest National Park and the Painted Desert. 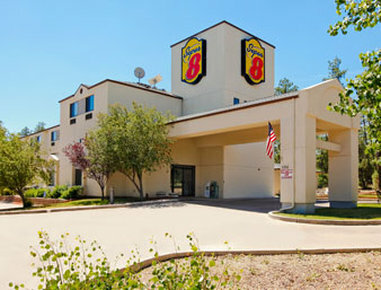 This Show Low, AZ hotel is close to fishing, camping, skiing, golfing, horseback riding and gambling. There are a wide variety of restaurants and cocktail lounges located in the area. Guests will enjoy many amenities including a free Continental breakfast, free local calls, free newspaper and free coffee. Some rooms also have a microwave and refrigerator. After a day of sightseeing, be sure to relax in the hotels indoor heated pool and Hot tub.